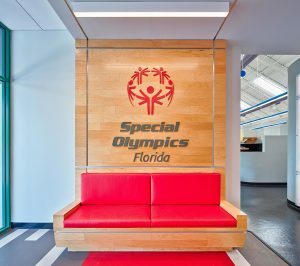 When Special Olympics Florida contacted Walker Design for their lobby and donor wall redesign at their corporate offices in Clermont, Florida it was an easy decision to provide pro-bono design services for the non-profit. Having volunteered at past Summer Games, the Walker Design team was familiar with the organization’s history and inspiring brand story. The client’s objective was to refresh the office lobby and incorporate a new donor wall. 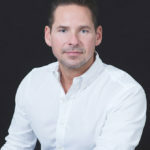 It was important that the donor wall be versatile and impactful, seeking to embody the powerful brand and celebrate the athletes, while recognizing the patrons. The donor wall was designed as a series of digital screens, which gives the client ultimate flexibility regarding content. 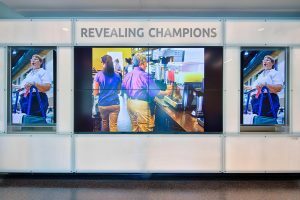 The two portrait oriented monitors were designed to showcase athlete photos while the center monitors highlight donors and events. Surrounding the monitors are back-lit writable white glass panels that frame the digital screens. 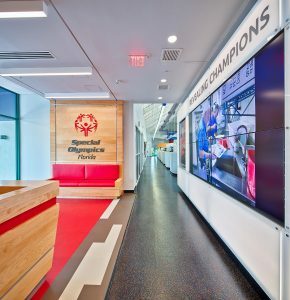 The visiting athletes and families are encouraged to leave messages to other visitors which creates an interactive and vibrant focal point upon entry into the Special Olympics Florida Headquarters. The lobby redesign includes feature lighting, branded finishes, audio visual integration, a reception desk that accommodates an electronic convenience vehicle and integrated visitor seating. These elements incorporate the brand’s color palette, which was missing from the original lobby. Now imbued with the corporate logo and inspiring brand messaging – the lobby design embodies the organization’s culture and brand identity. 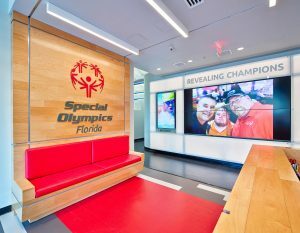 In addition to providing pro-bono design and construction documents, Walker Design introduced Special Olympics Florida to several strategic partners in the industry, including RLH Construction, Ingenuity Engineers, and Landreth Lighting who also donated time, products and services to the project in order to achieve a successful outcome.